It's been a year-and-a-half since I lasted posted. Rest assured, I am still knitting. Perhaps not as prolifically before, but nevertheless, I still have projects I've been starting -- and finishing -- since that fateful Argosy Shawl (see below). Perhaps I will revive this blog this year. Or perhaps, once again, it will become dusty again as New Year's resolutions fade into the February sunset. I'm a different knitter than I was in 2007. I buy far less yarn (it's a bad economy, in case you hadn't heard). I have a different job that I like much, much better, so knitting-as-therapy isn't as crucial to my psyche. I have sworn off knitting sweaters (for now) as I have found even the FOs that look beautiful blocking are difficult to wear. I hate to admit it, but I'm much more fond of sporting my Gap sweaters. Signing off until next time -- be it in 2009 or 2011! Here it is: The finished Argosy Shawl from the lovely knitter at inahappycamper who I automatically like because her happy camper reminds me of my 1973 Boler. I knit this out of 6 skeins of Classic Elite Premiere on size 6 needles. The pattern, which is another take on the Argosy scarf pattern the same knitter published in Knitty, is very addictive, soothing and all that good stuff that knitting should be. 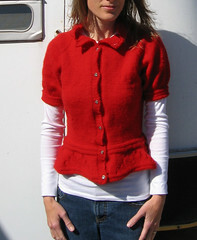 Stay tuned for two soon-to-be-done FOs: A shrug from Lace Style and my Lace Leaf Cardigan from Fitted Knits. (The latter is on my lap right now, waiting for me to finish seaming it). I've been back a week from my little road trip, but didn't get around to downloading photos until this morning. Okay, make that photo. I'm still in the process of updating my Flickr page with vaco pics. 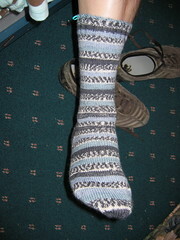 But, in order to reduce the suspence, here is the husband sock I blogged about on the road. This is the one that turned out the first time. The one that I had to rip and start over got finished about 30 miles outside of Boise, thankfully not making a liar out of me. I had promised D that he'd have his pair of socks before the trip was over. Of course, I thought I'd be started on this during the trip, too (using the sale cotton angora), but that didn't happen until last night. Also, work continues on the Argosy. In none knitting content, I had more fun with vending machines yesterday than I have since I was in Japan. First, we got $1 fresh made mochaccinos out of the new machine at the Boise Public Library (and I got the May Vogue for 50 cents in the book store there). Then, we booked it to Albertsons on our bikes and rented "The Queen" via vending machine for $1. I love it! (And I'll let you know what I think of "The Queen" later....). See how often I can post when I'm not working? Today is the last day I took off from work (I've still got the long weekend ahead) and I'm already feeling nostalgic for this trip. This morning, we got up early and rode our bikes into the Foothills here in Chico and now we're getting ready to leave for Sacramento, the penultimate stop in our little California/Nevada road trip. Yesterday we hit three places of note: First, we lunched at Tacos Cortez, a super-cheap burrito joint D discovered 15 years ago when he lived here. The place has been a legend in our relationship. It's possible he told me about it at our very first meeting 13 years ago in DC. And now I have seen it with my own eyes. Second, we hit a yarn store, Knit Wits in Paradise (in the mountains above Chico). I bought some lovely Cascade Magnum to make this. D helped me pick it out, then waited patiently while I pawed through the sale bin. What a sweetie! Third, we walked around the Thursday Farmer's Market, buying locally grown cherries and almonds and buying a bottle of locally made olive oil. We'd have a hard time doing that in Boise! Now, into the shower, one more trip to the Naked Lounge for the requisite double macchiatto, then in the car again, still knitting the socks I flubbed up a couple of days ago. Here's another posting from the road. Work on D's sock has come to a halt as I realized halfway through the gussett decreases that this, the second sock, was significantly shorter than the first. Drat. And now for some on the road ripping. As for the trip, it's been splendid. Yosemite is beautiful. I lost D on a hike and cried in front of a nice man named Richard who helped calm me down until D came off the mountain. The entire incident was entirely my fault. Really, I have no common sense. In Yosemite, we stayed in this place called Curry Village, with wall-to-wall tent cabins, shared bathrooms, and about a million middle-school aged kids there for some program. We ate pizza two nights in a row, and one day, due to my poor planning, went on a 8-mile-round-trip, straigh-up-straight-down hike with only banana chips and sesame honey almonds for lunch. Needless to say, when we drove into Chico, CA, (where we are now) and walked into our fabulous room at the Hotel Diamond, I felt like I'd gone to heaven. On the agenda today: More bike riding, burrito eating (we had burritoes for breakfast, lunch and dinner yesterday), knitting, and yarn shop finding. I'm posting this from Carson City, Nevada, on my way to Yosemite. I have a camera, but no fire wire, so you'll have to make due with my descriptions. It's a car trip, so there is much knitting. D's birthday was yesterday, so in honor of that event, my first car knitting item of business is a pair of socks for him. I've got one down and about 3 inches on the second. I also plan to work on my Argosy Shawl and I'm hoping to start this Fitted Knits cardigan using Cotton Angora I scored at an LYS sale. Interesting sights so far: All the crazy casinos (like the one right next to the state Capitol building here); the beautiful mountains after the straight, long road to get here from Boise; a cottontail bunny hopping as we road our bikes this morning through a cool old Carson City neighborhood at dawn. It's Fitted Knits, the sequel. And while I thought nothing could top the first entry (the ribbed shrug), this one definitely comes close. It may even be the Spiderman 2 of Fitted Knits (fitting, isn't it, then that it's red?). 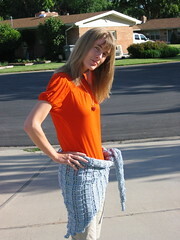 The details: I used Knit Picks Merino Style in Maple Leaf (just like the sweater in the book). The project took six skeins, and I do mean six skeins. I have about a yard left over. I followed the instructions in the book to make a 33-inch chest (instead of 34) and made it a few inches longer (because I am longer). I began it on a flight home from Baltimore. I bound off at a party with my knitting friends. I sewed the buttons on while watching America's Next Top Model. Overall, a very satisfying knit. Now, on to Fitted Knits project 3! (I'm not counting the two failures caused by my boneheaded yarn substitution ideas). (I've also got another couple of projects on the needles. See photos of them on my Flickr page. I'll be blogging on those as soon as I make a dent in that huge stack of portfolios I need to grade by the end of the week).